Giveaway ends February 17, 2018. A.J. Flower is brewing up something good for 2018! ​Work has commenced on the first draft of the second novel in the 'Resurgence Series,' this new installment will be published next year but the title and exact publication date are TBA. Hello everyone, thank you for stopping by my website and to all of you who have read my work or are just about to - thank you for all the support and kindness you have shown. It is the fulfillment of a lifelong dream to know that even a small part of my story has provided some enjoyable escapism to someone - and for those of you who even said you wanted more - I promised I wouldn't let you down and here we are! 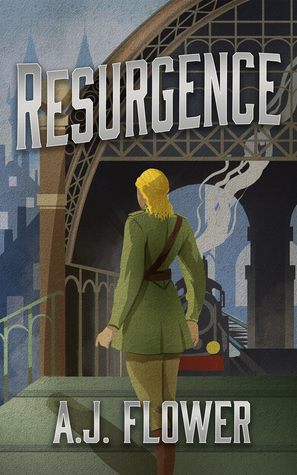 With all the threads left over it has taken a lot more planning than the first book, but I'm thrilled to be finally underway with the sequel to 'Resurgence' and it's wonderful to be finally back in the sky with Mary and Gresham! The sequel will pick up shortly after where we left the world of 'Resurgence' and I promise you even more sumptuous locations, explosive escapism and page turning mysteries. You'll get to spend more time with some characters who were good but brief company in the last story as well as a pantheon of new ones from the downright intoxicating to the distinctly unsettling. I'm seriously loving every minute of writing it, and I very much hope next year you'll all enjoy reading it just as much. There will be more snippets, teasers and announcements along the way before it's published, as well as competitions and giveaways - but only for you lovely people who visit my website, so be sure to swing by again. ​Dating back centuries, this herbal liqueur was first crafted by monks believing it had supernatural powers. Amaro Montenegro is the variety favored most by a very 'cultured' friend Mary and Gresham make on their travels. Amaro Montenegro is a traditional amaro distilled in Bologna, Italy. It is made using over 40 herbs, including vanilla and orange peels, bottled at 23%vol. The amaro was first produced by Stanislao Cobianchi in the late 19th century and is named after Princess Elena of Montenegro. Originally only produced in small monasteries production quickly grew in the late nineteenth century to huge to expansive plants to cope with demand. The distillation process varies, but typically centeres around a unique recipe of herbs and spices that are infused into a rich spirit after maceration. Secrecy always remains integral – so much so that only a few family members of each generation know the recipes, with different Amaro flavor variations including everything from flowers to roots. Similar liqueurs have traditionally been produced throughout Europe. There are local varieties in Germany (where they are called Kräuterlikör), in Hungary, the Netherlands, and France, but the term Amaro is applied only to the Italian varieties. Obviously, we don't want any plot spoilers for visitors who haven't read 'Resurgence,' those of you who have will know of the significance these two visionary pieces of work play in Mary's first taste of international espionage. These are hand-drawn designs by the legendary Italian Polymath (someone who knows a lot about lots of different subjects) Leonardo da Vinci, for a fighting vehicle and a helicopter, drawn over 500 years ago. The fighting vehicle is sometimes described as a prototype of modern tanks, da Vinci's armored vehicle represented a conical cover inspired by a turtle’s shell. The covering was to be made of wood and reinforced with metal plates that add to thickness. The machine was powered by two large inside cranks operated by four strong men. The vehicle was equipped with an array of light cannons, placed around the perimeter. His sketch for a rotorcraft, also known as the "Helical Air Screw" or simply the "airscrew", from the late fifteenth century is widely regarded as the predecessor to the modern day helicopter. As with many of da Vinci’s ideas, he never actually built and tested it – but his notes and drawings mapped out exactly how the device would operate. "If this instrument made with a screw be well made – that is to say, made of linen of which the pores are stopped up with starch and be turned swiftly, the said screw will make its spiral in the air and it will rise high." In other words – the device was designed to compress air to obtain flight – similar to today’s helicopters, and would have been powered by four men standing on a central platform turning cranks to rotate the shaft. Unfortunately, due to weight constrictions, modern scientists do not believe da Vinci’s invention would have been able to take flight... yet. ​The Palazzi Barbaro are a pair of adjoining palaces, in the San Marco district of Venice. They were formerly one of the homes of the patrician Barbaro family, one of the preeminent noble Venetian families . The Palazzi are located on the Grand Canal of Venice, next to the Palazzo Cavalli-Franchetti and not far from the Ponte dell'Accademia. The buildings are also known as the Palazzo Barbaro-Curtis. It is one of the least altered of the Gothic palaces of Venice. The building is actually two palaces, the gothic building that can be dated around the 1420’s and the wing added in 1698. Any wonder that Jimmy found it a useful headquarters for his operations in Venice. Who wouldn't want to be the guest of a family who loves to party Italian style -that live in a gondola boatyard in the middle of Venice? Arabella and her family may be fictional, but their boatyard home (also known as a "squero") where Mary spends one of the most amazing nights of her life was inspired by the incredible gondola boatyard at San Trovaso. Built in the seventeenth century, it is thought to be one of the oldest of its kind in Venice and has been home to many generations of skilled boat-builders. Amazingly, the yard still builds and repairs gondolas to this day, fashioning them from eight different kinds of wood - mahogany, cherry, fir, walnut, oak, elm, larch and lime - as tradition dictates. Although the boatyard isn't open to the public, anyone can enjoy a view of the gondola craftsmen at work from the opposite bank of the San Trovaso Canal. The Royal Waterloo Hospital for Children and Women is where Mary wakes to find herself confined after she attempts to commit suicide, and from where she is ultimately rescued. The original Hospital was built in 1823 but the building Mary stayed in and the one that can be seen today was constructed around 1903 and sits on a street corner near Waterloo Bridge. It was one of the first hospitals in the United Kingdom devoted to the care of sick children and women. After some controversy in its later years, the building actually closed as a hospital in 1976 and is now student accommodation. The building is grade II listed, however, which means the exterior has not changed much since Mary's stay at the hospital in 1913. The impressive Doulton-ware porch which Mary descends to the street during her escape with Matron Wallace can still be seen, and beautiful terracotta bricks still bear characterful lettering of the Royal Waterloo Hospital of 1913.